Josep Maria Jujol (1879-1949) created some of Spain’s greatest modern buildings in a style know as modernisme (the Barcelona equivalent of art noveau). In one decade, between 1913 and 1923, the young architect built five works that entitle him to be classified as a pioneer of Modernism; yet Jujol, a collaborator with Antoni Gaudí on some of that master’s most admired works, has been largely unrecognized and his independent architecture unknown. Josep Maria Jujol: Five Major Buildings places the architect’s work in the highly charged religious and political context of Barcelona – from the late 19th century through the Spanish Civil War and on the time of Jujol’s death in 1949. 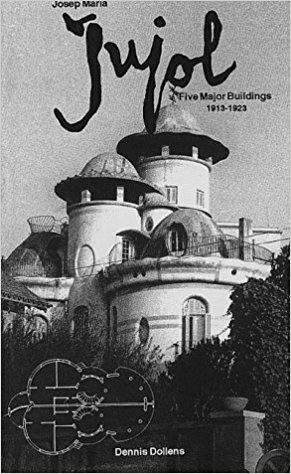 This book considers Juol’s career as parallel to, but not part of, the nascent avant-garde emerging from Barcelona’s cafe Els Quatre Gats and the Galleries Dalmau, with wich Picasso, Duchamp, Dalí, Sert and Miró were at ont time associated. Josep Maria ujol: Five Major Buildings traces the architect’s development in this and Gaudí’s conservative religious environment, as well as in a broader European frame. It also considers Jujol’s use of symbolic, abstract calligraphy, collage, and painting as advanced semiotic elements in an extraordinary amalgamation of craft, material, technique, and space fused into visionary architecture.